Featured Photo: Protest in the Plaza Bolivar in Caracas against GMO-February 2014. Photo by William Camacaro. On June 3, 2015, a network of grassroots organizations in collaboration with the legislative and executive branches of government, proposed a popular version of a Seed Law bill for consideration by the National Assembly that would ban all forms of transgenic seeds in Venezuela and protect local seed from privatization. There was also a meeting held at the headquarters of the Ministry of Popular Power for Agriculture and Land on April 29, 2015, by the Vice Minister of Agricultural Plant Production, Javier Sánchez and legislators José Alfredo Ureña and Manuel Briceño, as well as the Director of Investigation and Legal Consultancy of the National Assembly, José Gregorio Viana, to “discuss and refine” the details of the Seed Law “with the purpose of guaranteeing Food Sovereignty.” These are signs that Seed Law legislation may soon come to the floor of the National Assembly for consideration. For Venezuelans who support agro-ecological farming and for the international movement against the use of transgenic seeds, passage of the popular version of the Seed Bill would constitute an important victory. The battle against transgenic seed in Venezuela, however, is far from over. The pressure from transnational corporate interests and their local allies on even the most independent of the Latin American states, such as Venezuela, is still quite formidable. The grassroots consensus across the country, though, is clear: no to transgenic seeds and yes to agro-ecological farming. 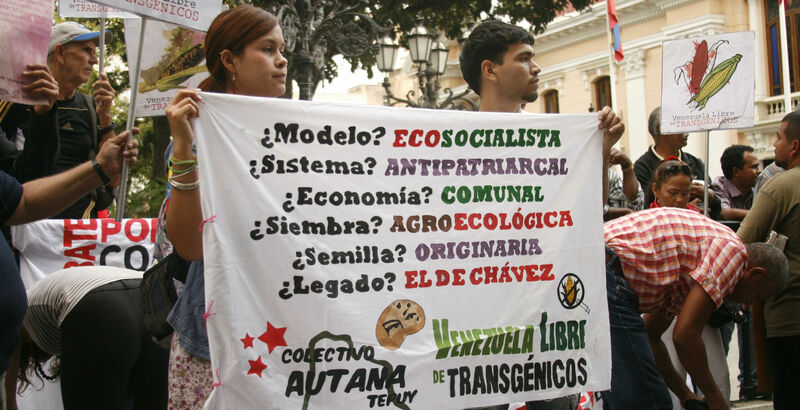 The balance of forces with regard to transgenics in the National Assembly depends on whether Chavista legislators will be obedient to the strong popular support for social rather than private control over seeds and for agro-ecological over conventional farming methods. Seed policy in Venezuela is not only about which farming methods are best for the environment and for human health; it is also about the how to attain food sovereignty. Over the past year thousands of tons of Venezuelan food imports have not made it onto store shelves. Shortages of some basic products are caused, in part, by illegal hoarding and the diversion of food products to markets in Colombia and the domestic informal market. The expansion of domestic agricultural production and food processing are critical pieces of any strategy for overcoming shortages and speculation. Seed plays a central role in this endeavor. But what kind of seed? Transgenic seed, privately owned, could be used as just one more weapon to increase economic and political pressures on the government. Local seed under state and collective control is much less likely to become a political weapon against Venezuela by foreign interests. The Venezuelan National Assembly is probably going to take up consideration of the Seed Law in the coming days after nearly two years of public debate on the issue. While eco-socialists are happy to move full speed ahead, some sectors of the nation’s Federation of Chambers of Commerce have cautioned against an all out ban on transgenic seed. They urge that the science is not conclusive with regard to the human health implications and environment impact of transgenic seed. For example, the president of Fedeagro, Antonio Pestana, addressing the debate over transgenic seed in 2013, urged that “the opinion of Venezuelan scientists who are expert in biotechnology and transgenics ought to be heard during the public consultation that will be promoted by the National Assembly with regard to the Seed Law.” Pestana points out that Mercosur countries, of which Venezuela is a member, make significant use of transgenic seeds and that Venezuela imports some of the harvest. For example: “all of the soy and yellow corn brought from Brazil and Argentina are from transgenic seeds” and “Bolivia has 1.5 million hectares of transgenic soy and all of the soy we import from there is transgenic.” Such hesitation to enact an all out ban on transgenics was reflected in a provision (Article 34) of an earlier 2013 version of the Seed Bill. One of the main legal battles at the heart of seed policy revolves around the very nature of seed. The champions of for-profit private control over seed generally prioritize the exchange value of seed over its use value in the marketplace. For the market-oriented approach to seed, the seed’s function as a use value for the satisfaction of human needs, and in particular the need for nutrition, may be important, but it is nevertheless secondary to the profit motive. On the other hand, Venezuelan agro-ecologists and eco-socialists view seed primarily in terms of their use value. The concept of “use” here needs qualification because as living things seeds are not mere objects, but are in some sense subjects of life. As living things, seeds serve humanity and the collective ownership of seed is an indispensable tool for the eventual achievement of food security and the food sovereignty. The main challenges facing the agro-ecology and eco-socialist organizations in Venezuela then, are to keep the living seed in the hands of Indigenous, Afro-descendant, peasant, and local communities rather than in private sector hands, and to propagate and cultivate this seed using the ancestral knowledge and the experience of these communities rather than the methods of big agribusiness. In “Venezuela and the Battle Against Transgenic Seeds,” Mills and Camacaro (COHA, 2013) described in some detail the process through which pro-ecology forces in Venezuela were able to halt the promulgation of a regressive Seed Law proposal in its tracks in November 2013. What was being sold as a progressive legislative proposal unraveled as word spread that some of the provisions of the bill would allow the import of and domestic development of transgenic seeds; the patent of Venezuela’s hybrid seeds; and the imposition of cumbersome regulations on the use and exchange of semilla campesina. For these reasons, this particular proposal could be called the stealth version of the Seed Bill. Shortly after its introduction on the floor of the National Assembly, the stealth version of the Seed Bill met with staunch opposition from the agro-ecology movements in Venezuela, including the Guardians of Seed, The National Peasant Front Ezequiel Zamora (FNCEZ), Revolutionary Current Bolívar and Zamora (CRBZ), and Venezuela Free of Transgenics. Under pressure from the agro-ecology network, the procedures for hammering out new seed policy became the co-responsibility of both the legislative branch of government and other major stakeholders, particularly farmers and consumers. The goal of this exercise in pueblo legislador (the people as legislator) has been to replace a regressive seed law proposal with one consistent with the express eco-socialist commitments of the Country Plan 2013-2019. This Country Plan is a major guidepost for the Bolivarian revolution in Venezuela because it was the platform of Hugo Chavez’s last presidential campaign and it became the law of the land (December 4, 2013) during the first year of the administration of President Nicolás Maduro. It is relevant to the debate over seed policy because the Plan includes, among its major objectives, “the construction of an eco-socialist economic model of production based on a harmonic relationship between human and nature that guarantees the rational and optimal use of natural resources, respecting the processes and cycles of nature” (Plan, Introduction). This endorsement by the Council of Communes is important because many of the more than 1,140 communes engage in agricultural production and receive inputs, financing and technical assistance from the state. So the labor of these constituents would be directly impacted by any seed law. So far the process for the formulation of seed policy has been participatory and democratic, an important instance of co-responsible governance between the organized expressions of popular power and the constituted power of the state. As the draft preamble to the law indicates, the proposal is the result of “two years of intense debate . . . with participation from 148 grassroots organizations, 162 institutions and educational centers from across the entire country. It is also the product of the agreements constructed by work groups with representatives from the Legislative and Executive Powers.” In keeping with the democratic procedures used to develop the proposal, the proposed law would guarantee the continued participation of popular power in the planning and execution of policies related to seed law through an allotment of seats on a National Seed Commission (Article 11) and a Popular Council for the Storage and Protection of Local, Peasant, Indigenous, and Afro-descendant Seed (Article 50). “preserve, protect, and guarantee the production, propagation, conservation, free circulation and use of seed, as well as the promotion, investigation, distribution, and commercialization of the same, based on an agro-ecological socialist vision, with the aim of consolidating our food security and sovereignty, prohibiting the release, the use, the propagation, the entrance into the country, and the national production of transgenic seeds” (Article 1). This prohibition of transgenic seeds has real teeth because the proposed law would also set up The National System of Seed that will “develop and guarantee the technical, organizational, and institutional ability to prevent, identify, detect, correct, remedy, and sanction violations of this prohibition” (Article 5). The popular version of the Seed Bill would also protect the Indigenous, Afro-descendant, peasant, and local seed from private appropriation and exploitation and encourage the free exchange of both seed and the bio-cultural knowledge of farmers through what is called licencias libres (free licenses). For example, the bill would prohibit the imposition of royalty payments on the use of such seed (Article 25). The law also exempts semilla campesina from a number of certification requirements, though still subject to quality control, and encourages their exchange, propagation and improvement by means of agro-ecological methods (Article 25.5). The current draft of the popular version of the Seed Law, the result of the exercise of co-responsibility of the public and popular sectors, is a real test of participatory democracy and the consistency of the government in promoting the letter and the spirit of the Country Plan 2013-2019. Both the country’s food independence and the eco-socialist direction of agricultural policy depend on the objectives, articles, and provisions of the Seed Law. It is still possible, at this late hour, for another stealth version of the Seed Law to surface under pressure from the transnational corporate lobby and their local allies. The agro-ecological movement, however, won’t be fooled again. Note: All translations from Spanish to English are unofficial. « Venezuela has invested US$142 billion dollars in food programs over the last 10 years.